Every agency worth their website will tell you that they have a unique and distinct way of making sense of the world – and thus making you money. There are reasons both sincere and cynical for this. Among the sincere reasons is the fact that every agency is, actually, quite different from every other agency (this is what happens when your product is stuff that comes out of people’s brains). Among the cynical reasons is that it’s a helluva lot easier to sell a vision to prospective clients than it is to sell the promise of sales because you can fulfill your vision whether the sales happen or not. So it is not unusual that Ty Montague – whose resume includes running the New York office of W+K, launching the New York office of BBH and transforming all the offices of JWT (as Co-president and CCO) – should write a book telling you of the distinctive approach that is unique to him and his latest venture, co:collective. What is unusual is that it is actually distinctive and unique. What is unusual is that it is actually very insightful and not a little revolutionary. What is unusual is how important it is. Taken as a starting place, this fundamentally changes the nature of marketing because it shifts the roles of the tools we normally use to market. Usually we create a story (or, if we’re lucky, find the story within the brand itself) to use as a vehicle for explaining products to consumers. In this ancient scenario, the story is necessarily constructed after the product is finished, and the story’s mission is to get people to like something that already exists. But if Montague is correct then this necessarily means that the story cannot simply be tacked on at the end of the process. It must be – or rather, is – intrinsic from the very beginning. One could dismiss this as simply the efforts of a marketing guy to elbow his way up to the front of the line, weary of feeling like the very small tail of a very large dog and trying to elevate at the least himself and at the most his craft to a position of greater importance. A second insight then follows quickly on the first and it makes up the bulk of Montague’s examples in the book. If stories are not vehicles for brands but intrinsic components of them, then it stands to reason that the brands that actually live their stories, that don’t just tell them but actually do them, will be the ones who are successful – not only because they will be seen to be walking the walk (and thus demonstrating the legitimacy of their claim), but actually acting in the way consumers expect brands to act. Or, said another way, not simply fishing where the fish are, but fishing the way fish want to be caught. If one then takes this thinking a step further and thinks about it in terms of how human beings actually engage with products, one realizes the greater power of Montague’s insight. Brands are a shorthand that we use to tell each other stories about ourselves – the flags and badges and symbols we flash that explain what we think is important, who we admire, what we think. In other words, we are walking stories. We swim in a vocabulary of brands – and the brands who realize this and take advantage of it in a meaningful, substantial way, will be the ones who will, as Montague has rightly observed, succeed. And for everyone else? That’s another story. 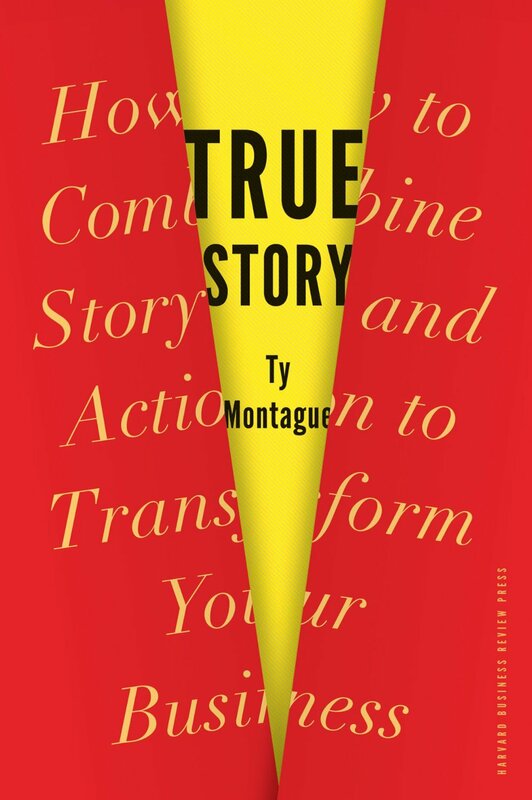 True Story: How to Combine Story and Action to Transform Your Business by Ty Montague was published by Harvard Business Review Press on 07/16/13 – order it from Amazon here or from Barnes & Noble here – or pick it up at your local bookseller (find one here). I think you’re quite right to conclude that the end of this story-embodying business is when a consumer chooses a particular brand over another as a means to tell his or her own story. (Or to mislead others, and possibly themselves, through the use of or “misreading” of a particular story.) See: Red Sports Car metaphor. Of course, the problem with storytelling is that people’s attention is easily distracted by brighter or louder, or simply more a compelling or attractive storytellers. The test for a brand is to so ingratiate itself through performance and innovation that it becomes the most persuasive voice in the room, regardless of changing narratives, a la Nike, or Virgin, or IBM or Ralph Lauren, who happen, at the moment, to be the Homers of our age.